Bats are busy! 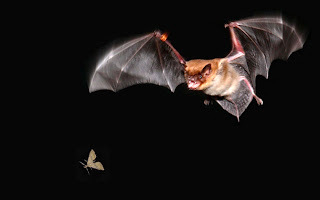 Ecosystems around the world, from tropical forests to dry deserts, depend on the activities of bats for plant pollination, seed dispersal, and insect consumption. Bat species native to North America, particularly those found in the Southwest (like in Texas), can consume their body weight in insects every night, meaning that a bat colony can literally eat a ton of bugs! Farmers and agriculture benefit tremendously from bats hanging around. Pests, such as the corn earthworm moth, infest commercial plants ranging from melons to corn, soybeans to cotton. A study into the foraging habits of bats found that bats contribute to an estimated 99% suppression of potential crop pests through natural means. One recent study in the United States concluded that bats can save a farmer an average of $74/acre of land. This value equates across the whole nation as a total savings of $22 billion dollars per year! Here in Texas, bats save our farmers about $6.4 million per annual cotton harvest. Not only to do bats directly impact our own food by eating bollworms, mosquitoes, and larvae harmful to agriculture, but every acre of land that bats forage over is in far less need of toxic pesticides. Less industrial products used means better foods, so bats naturally help us eat healthier! Bats also eat pesky mosquitoes, which helps control mosquito populations. By reducing the number of mosquitoes bats not only make being outside more enjoyable but also help control the diseases that mosquitoes carry, such as West Nile Virus. Here in western Texas, bats are an important keystone species. Where bats populate, soil nutrients are replenished through their droppings (called “guano”), insect pests are eaten, and even natural resources can be monitored by bat activity. For example, bats need a lot of water to fuel flight, and with severe droughts in west Texas bats act as barometers for the rainfall that replenishes the playas. In these many ways, bats are a wonderful part of Texas and are integral to sustaining the future for both themselves and for us.